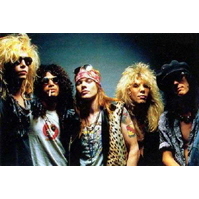 Band Bio: Guns n' Roses came out in late 1987 with their first real c.d called Appetite for Destruction. That c.d sold over 15 million copys in it's time and that's not in counting theses days. People liked Guns n' Roses because they were such an amazing group of talent. The lead guitar player slash is considered a guitar God from the solos his has played. His Guns n' Roses solos are in the top guitar solos of all time. People forget about bands like them that started a era of good amazing rock music. Guns n' Roses has gone down in history as one of the best bands in the history of rock music.